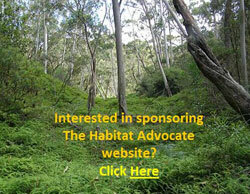 The Habitat Advocate » Blog Archive » Tiger Quoll? Photo courtesy of Sean McClean. It is Australia’s largest carnivorous marsupial on the mainland and it has become endangered because of humans destroying its habitat, shooting it and poisoning it. It is not a cat. Much information may be obtained online simply by typing ‘tiger quoll’ on Google. “Without disrespecting the Koala or Kangaroo, the Tiger Quoll is one of Australia’s most interesting animals. It sort of resembles a cat except it has a pouch, bright eyes, a moist pink nose and a powerful bite. It can grow to up to 75 cm in length and weigh up to 7kg. If trained, it will even use a kitty litter tray. The Tiger Quoll is the type of animal that tourists would love to see on their Australian safari. Unfortunately, they are quite rare so few have ever caught a glimpse of them. European colonisation of Australia could have been great for the Tiger Quoll. With Europeans introducing rabbits, rats and mice, the Quoll saw a drastic increase in its food source. Had the colonists warmed to them, then a mutually beneficial relationship could have formed. Farmers could have encouraged Quolls to take up residency in order to keep rodent numbers down with little fear that their livestock would be in danger. As an added bonus, by eating carrion, the Quolls would have reduced the threat of blowfly strike. “I just can’t praise these animals highly enough as companions for human beings. They have all the good features in dogs and cats, and in my experience not a single downside”. If colonial owners had taken care of their Quolls, then both Quoll and owner would have been happy. If not, the Quoll would have just escaped and done Australia a service by cleaning up decaying meat, rabbits and other introduced vermin. Unfortunately, colonists never formed mutually beneficial relationships with the Quoll. Instead, they introduced the cat to serve the role of pest controller. For more than a century, farmers deliberately released cats onto their properties in order to control rabbit and mice populations. Once the cats went feral, they started to compete with the Quoll for food. Although the Quoll was better adapted to Australia’s cycle of droughts, the cat’s symbiotic relationship with humans proved to be an even better environmental adaptation. If feral cats were ever wiped out in a drought, or declined for whatever reason, they still had the family home as an oasis in the desert. From the family home, they were well placed to repopulate the bush once good conditions returned. Even worse than competition from the cat were the environmentalists’ attempts to “help” them. The use of 1080 poison has been one of the main helping strategies. When it is used to kill rabbits, it indirectly deprives Quolls of food. So much so, by killing rabbits, human deprive Quolls of even more food than is lost due to competition by cats. To compound matters, when 1080 poison is used to kill the cats and foxes competiting with Quolls, it also ends up being eaten by Quolls. In fact, Quolls are more likely to eat the poisons because they have a keen nose for carrion while the feral predators prefer fresh kills. A very odd example of the misguided environmental policy was recently seen in in Tasmania. 1080 was first used to reduce rabbit numbers. A rumour then developed that foxes had finally established a breeding community in the island state. Even though it was just a rumour, to be on the safe side, environmentalists decided a large scale baiting regime needed to be implemented to eradicate foxes as well. On the State Government’s own data, more than 140,000 poison baits were laid. So far, there has been no evidence that foxes were actually present. There was; however, plenty of evidence of Quoll dying! The use of 1080 poison could be legitimately referred to as Australia’s dumbest environmental policy since the construction of a 1,833 km fence to “keep” rabbits out of WA. It seems that Western Australians weren’t smart enough to realise that rabbits can dig under fences. All that was required was for a single pregnant female to dig a hole and then 1,833 km of fence line would be obsolete. Perhaps WA politicians did in fact realise the folly of it all, but decided it was more to important to show they were “doing something”. Even though the Tiger Quoll is mainland Australia’s largest native predator, Australia doesn’t have any professional sporting team named after them. In fact, they don’t really exist in public consciousness in any significant shape or form. Perhaps this is because Quolls spend their time out in the bush where they are only ever seen by rangers. Alternatively, perhaps the name Quoll just isn’t scary enough. Zoos – The only real industry is as a research subjects by scientists, or to provide an endangered animal story that can be used by wilderness groups to write emotive appeals asking for funding to save them. 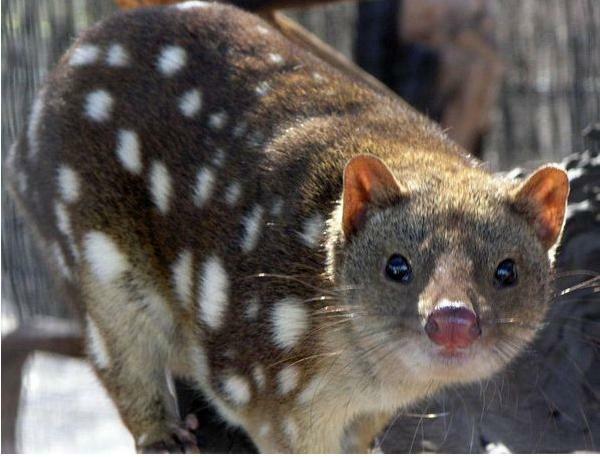 Pest controllers – Potentially, Quolls could make great pest controllers. They could compete with cats and foxes for food, and eliminate rabbits and rats in the process. Landowners could breed them and sell them as a substitute to 1080 poison. “The Upper Snowy River and its tributaries was the Victorian stronghold of the Tiger Quoll before (the 2003) devastating Alpine bush fires. The Tiger Quoll is believed to have lost up to 75% of an estimated population of 1,000 in the area. This entry was posted on Tuesday, June 14th, 2011	and is filed under Gippsland (AU), Quolls, Tasmania (AU), Threats from Bushfire, Threats from Deforestation, Threats from Development.